African women have made history as doctors, merchants, slaves, prostitutes, and religious leaders. 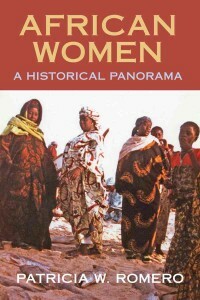 In this survey of the roles women have played in sub-Saharan Africa, from the Queen of Sheba in Ethiopia to the elected presidents of contemporary Liberia and Malawi, Romero discusses education and religion, medicine and the occult, and the presence of women on the political stage, including their roles as environmental activists. Nothing thrusts the issue of gender into recent African history more starkly than war. Entire sections are devoted to anti-colonial conflict and the toll on women’s health, beginning with Mau Mau and Kenya’s rebellion against the British in the 1950s and continuing to the tragic consequences for women in the Republic of Congo. Drawing on the latest research, including travelers’ accounts and case studies, this readable volume presents a wealth of carefully selected documents, illustrations, and maps to complement its coverage of precolonial, colonial, and post-colonial Africa. Patricia W. Romero (Johns Hopkins University) is the author and editor of numerous books, including Women’s Voices on Africa: A Century of Travel Writings.